This adorable couple is getting ready to go to prom. The girl is really excited about the Prom Queen and King contest. She really wants to win, so she needs to look wonderful tonight. Will you give her some fashion tips? She wants to dress in the cutest clothes! Try some elegant dresses with high heels for the perfect outfit. Then, you can do her hair and change the color too. Don’t forget the accessories! Finish the look with a sparkling necklace and find some earrings to match it. Now, this pretty lady is ready to win the prom contest! Play again if you want to create a different look. 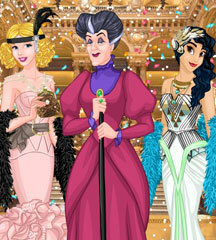 You can show your most innovative fashion ideas in one of the most stylish girl games!